Mas Grange Blanche is owned by the Mousset company, which is a large Rhone Valley firm that owns and distributes several Southern Rhone wines including Chateau des Fines Roches. In fact, the wine of Mas Grange Blanche is made in the same cellars that are used and owned by Chateau des Fines Roches. In addition, they also own Jas de Bressy and Domaine des Saumades. Mas Grange Blanche comes from 3 hectares of vines planted in the Chateauneuf du Pape appellation. Mas Grange Blanche produces 2 red Chateauneuf du Pape wines. They also make wine in the Cotes du Rhone appellation and a Vin de Pays. Mas Grange Blanche Chateauneuf du Pape is produced blending 70% Grenache, 20% Syrah and 10% Mourvedre. The terroir is pure galets in the les Combes and la Crau vineyards. Vinification takes place in traditional concrete vats. The wine is aged in a combination of old, used, French oak barrels, tanks and demi-muids for 18 months. Mas Grange Blanche la Font de Bessounes is made from a blend of 3 different grape varietals, 70% Grenache, 20% Syrah and 10% Mourvedre. The terroir is rock and stones in the les Combes and la Crau vineyards. Vinification takes place in traditional concrete vats. The wine is aged in a combination of old, used, French oak barrels, tanks and demi-muids for 18 months. Mas Grange Blanches can be enjoyed on the young side. Young vintages can be popped and poured, or decanted for about 1 hour. This allows the wine to soften and open its perfume. Older vintages might need very little decanting, just enough to remove the sediment. Mas Grange Blanche is usually better with 1-3 years of bottle age. Of course that can vary slightly, depending on the vintage. In the best vintages the wine should be consumed within 2-8 years after the vintage. Mas Grange Blanche is best served at 15.5 degrees Celsius, 60 degrees Fahrenheit. The cool, almost cellar temperature gives the wine more freshness and lift. Mas Grange Blanche is best served with all types of classic meat dishes, veal, pork, beef, lamb, duck, game, roast chicken, roasted, braised, stewed dishes, sausage, barbecue, grilled meats and cassoulet. Mas Grange Blanche is also good with Asian dishes, hearty fish courses like tuna, mushrooms, cheese, pasta, eggplant and tomatoes. 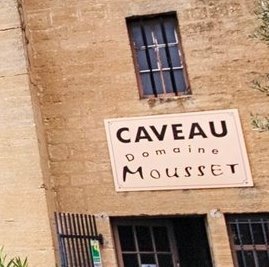 The Mousset company produces and distributes 2 other red wines from Chateauneuf du Pape, in addition to the estates we previously listed, Domaine de Tourt Vent Cuvee Reserve and Domaines Mousset. Lush, round, sweet and forward, the fruit is ripe, the added notes of licorice and black cherry along with herbs hits the spot. This will drink just fine on release. The wine is blended using 70% Grenache, 20% Syrah and 20% Mourvedre. Round, forward and already quite tasty, there is ample sweet, dark cherries and licorice with a medicinal edge, think of cough drops, but in a good way. Simple, easy going and best enjoyed over the next few years for its bright, red berry charms. Light in color, medium bodied, forward, early drinking wine, focused of fresh, bright red fruits and herbs.